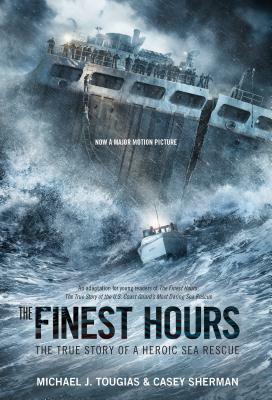 This adaptation for young readers of The Finest Hours: The True Story of the US Coast Guard's Most Daring Sea Rescue by Michael J. Tougias and Casey Sherman tells the story of the shipwreck of two oil tankers and the harrowing Coast Guard rescue when four men in a tiny lifeboat overcame insurmountable odds and saved more than 30 stranded sailors. Now a major motion picture from Disney, starring Chris Pine and Casey Affleck. On the night of February 18, 1952, during one of the worst winter storms that New England has ever seen, two oil tankers just off the shore of Cape Cod were torn in half. With the storm in full force and waves up to 70 feet high, four coast guardsmen headed out to sea in a tiny lifeboat to come to the rescue. They were the only hope for the stranded sailors. Despite incredible obstacles, these brave men risked their lives, remembering the unofficial Coast Guard motto: You have to go out, but you do not have to come back. This is a fast-paced, uplifting story that puts young readers in the middle of the action. It's a gripping true tale of heroism and survival in the face of the elements. Michael J. Tougias is the author and coauthor of more than a dozen books, including two bestselling true-adventure and survival books, Ten Hours Until Dawn: A True Story of Heroism and Tragedy Aboard the Can Do and Fatal Forecast: An Incredible True Tale of Disaster and Survival at Sea. Casey Sherman is an award winning journalist and bestselling author of six books including Animal, A Rose for Mary, Bad Blood, Black Irish, and Black Dragon. He received the Edward R. Murrow Award for Journalistic Excellence as a member of the CBS Boston news team, and has been nominated for an Emmy Award. A featured guest on major television networks and news programs, Sherman has lectured at The National Press Club and the US Coast Guard Command Center in Washington, D.C. He lives in Marshfield, Massachusetts.